thickening and induration of the auricle with distortion of its contours secondary to extravasation of blood deep to the perichondrium. 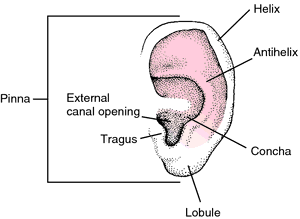 a thickened, deformed pinna and external ear caused by repeated trauma, such as that suffered by boxers. 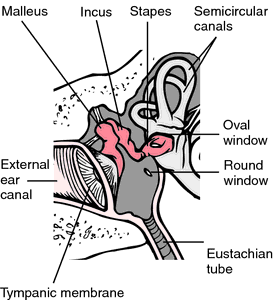 Plastic surgery may be a means of restoring the normal appearance of the ear. Thickening and induration of the pinna and external ear with distortion of contours following extravasation of blood within its tissues; a chronic deformity following (usually) repeated trauma. Plastic or reconstructive surgery will generally improve appearance. The result of repeated blows to the ears with bleeding between the cartilage and the skin, and the subsequent organization of the blood clot into fibrous tissue. One of the least serious occupational hazards of boxing. colloquial term for an auricular haematoma - a collection of blood within the pinna (external ear). Usually the result of trauma, especially common in boxing and rugby. The close adherence of the skin to the underlying cartilage of the pinna leads to painful stretching of the tissue, which may need surgical drainage and pressure to prevent further accumulation and later deformity.